Mercedes boss Toto Wolff has warned his team they could can still end the season without a title, despite leading both championships. Lewis Hamilton heads team-mate Nico Rosberg by 21 points, with Ferrari's Sebastian Vettel third, 42 points back. 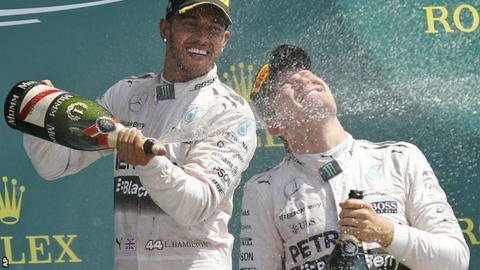 Mercedes lead Ferrari by 147 points in the constructors' championship going into this weekend's Belgian Grand Prix. "There are still many chances to win or lose and we must be relentless in our push to come out on top," said Wolff. "There is never a moment you can take your foot off the gas and Hungary proved once again that any slip is an opportunity our rivals will grab with both hands." Mercedes have won eight of the opening 10 races this season, but Hamilton and Rosberg finished sixth and eighth respectively in the last race in Hungary, which was won by Vettel after he overtook both his Mercedes rivals at the start. The Silver Arrows have had problems with their starting procedure for the past two races, having also lost first and second places to both Williams cars at the British Grand Prix before Hamilton reclaimed first place to win. "With 10 races down and nine to go, we enter the second half of the season with a stronger points total than at this stage last year, and yet our margin to the competition is actually smaller," added Wolff. "We have all enjoyed a chance to recharge over the summer - but we have also kept our minds focused on what lies ahead." There is no realistic danger of Mercedes losing either of the world titles this season, but there are things to work on for the remainder of the year. The car and engine are as good as flawless, but the team has betrayed operational weaknesses from time to time. These encompass strategy errors - such as Hamilton's late pit stop in Monaco, or odd tyre choices for Nico Rosberg in Hungary - and their suddenly shaky starts, a concern with a rule change restricting the level of automation of starts about to come into force.